Much liked and admired during his lifetime, Bush was one of the most talented students of his generation at Melbourne’s National Gallery School. He also won numerous prizes, including the Melrose Portrait Prize (with a self portrait in 1952) and the Wynne Prize (1952, 1955). He was a member of an early Australian cultural delegation to China in 1956 and fronted a national television programme ‘My fair lady’ about art and fashion between 1959 and1962. Bush taught drawing at the National Gallery School briefly in the 1950s and was art critic for The Australian in the 1960s. He and Phyl Waterhouse met at the National Gallery School and thereafter were virtually inseparable apart from the War years, when he enlisted (he was appointed an official War artist in 1943). Bush also studied in London under Bernard Meninsky and travelled through Italy, France and Spain with Waterhouse 1950-1952. They didn’t marry until 1979. Together with June Davies, he and Waterhouse were owner-directors of Leveson Street Gallery in Melbourne (1962-1985). 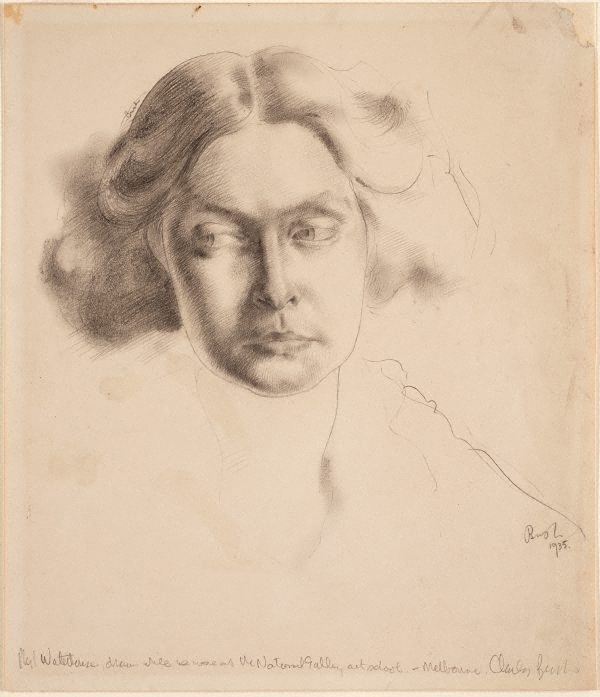 Signed and dated l.r., pencil "Bush 1935. ".